. A N A T O M Y . S T U D I E S .
Richard and I have begun to create some exciting new Facial Anatomy Studies to help with your sculpting needs. For years in both our classes and on our Instructional Videos we have recommended using anatomy in various forms to study and learn from, with lots of encouragement and prompting by our students we have at last created our very own Facial Anatomy Line for the Artist. We are really excited about this whole line as we feel it is something way over due for the individual Artists serious about perfecting their sculpting techniques. We began this series with the Human EAR. We now offer the ELDER HUMAN EYE Anatomy Study. 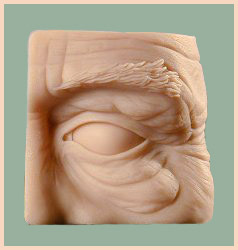 This should help sculptors with a very detailed close up look at facial lines and wrinkles around the eye as we age. Each Anatomy Study is cast in a high quality extremely durable resin that is lightly tinted to show all the beautiful details. We feel that by hand sculpting these studies instead of life casting them we offer you a more personal and special touch. Here is a sneak Peek into what we have in store for our Facial Anatomy Study line in the coming months. We are VERY pleased to announce that we will offer ETHNIC lines. Beginning with Asian and followed soon by African-American. Our Series will include the nose, mouth and eyes ... each can be purchased separately or in sets. Our ELDER HUMAN EYE Study is $18.00, Priority Postage is $4.00. CA residents please add $1.30 sales tax. You may purchase by sending a check made payable to JODI CREAGER. All artwork and images displayed in this website are protected by © Copyright 2000 Jodi & Richard Creager. All rights reserved.